Here are some modern songs which can be played as alternatives to hymns or in addition to hymns in Remembrance Day ceremonies. Such songs by current and recent recording artists are also called contemporary songs. - Includes embedded YouTube videos of the song with and without lyrics, and links to the mp3 audio file and to the lyrics to download free. This is a song from Dogmatic Music (facebook.com) specially written for use in schools. Though labelled "Anzac Day song for schools 2015 - 'Lest We Forget'", it is suitable for use in both Anzac Day and Remembrance Day ceremonies. Watch and listen to the YouTube video free. The same 3min17sec version is available for purchase and download from cdbaby.com. It is also sold as part of Dogmatic Music's Anzac Day Kit for schools. This is a 1min24sec sample of a song from Dogmatic Music (facebook.com) specially written for use in schools. Watch and listen to the YouTube video free. The full 3min29sec version is available for purchase and download from cdbaby.com. It is also sold as part of Dogmatic Music's Anzac Day Kit for schools. Greg Hastings performs War to End Wars. The lyrics (greghastings.com) are available. 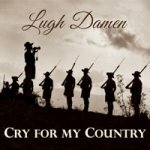 Singer/songwriter Lugh Damen has placed all eleven tracks of his album Cry For My Country on SoundCloud where you can listen to them free of charge. He also provides the lyrics. To My Fellow Man* (dedicated to all soldiers that have helped each other). Lyrics [pdf]. Battlefield* (vivid description of carnage). Lyrics [pdf]. Home From the War* (Vietnam veterans). Lyrics [pdf]. The Veil of Night (dedicated to women healers and nurses). Lyrics [pdf]. Cry For My Country (depicts Australia's history as a nation - ranges from the didgeridoo through to Waltzing Matilda). To download the album or individual tracks you need to pay through Lugh Damen's cdbaby page. For information about public performance licences for the downloaded songs see the licensing page [pdf]. Note the following information about free use of four of these songs. *The four songs marked with an asterisk may be used by schools and services organisations in Remembrance Day, Anzac Day and Vietnam Veterans ceremonies without having to pay a public performance licensing fee as long as permission is obtained first. MORE SONGS: Lugh Damen's songs of special relevance to Anzac Day are listed on our Modern Anzac Day music page. ● See also our John Simpson Kirkpatrick Songs section.